Over a dozen rainbows have been observed in a single water droplet. They appear as glare spots on the water droplet which take on coloration at the appropriate rainbow angles. The appearance of rainbows as colored glare spots in this situation is understood in terms of the caustics created in the vicinity of the droplet by the refracting light rays. The angular positions of the glare spots are understood in terms of the Fourier transform of the geometric scattering amplitude. The rainbow glare spots are also found to appear numerically in the Fourier transform of the Mie scattered fields. An additional glare spot produced by rays at grazing incidence and not attributable to geometric optics also appears numerically in the Fourier transformed Mie fields. 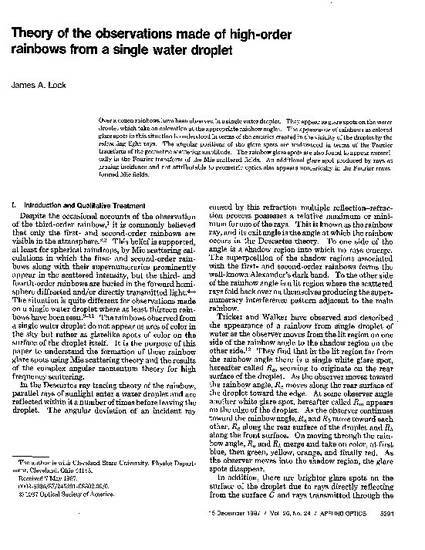 This paper was published in Applied Optics and is made available as an electronic reprint with the permission of OSA. The paper can be found at the following URL on the OSA website: http://www.opticsinfobase.org/ao/abstract.cfm?URI=ao-26-24-5291. Lock, James A. "Theory of the Observations Made of High-Order Rainbows from a Single Water Droplet." Applied Optics 26 (1987): 5291-5298.